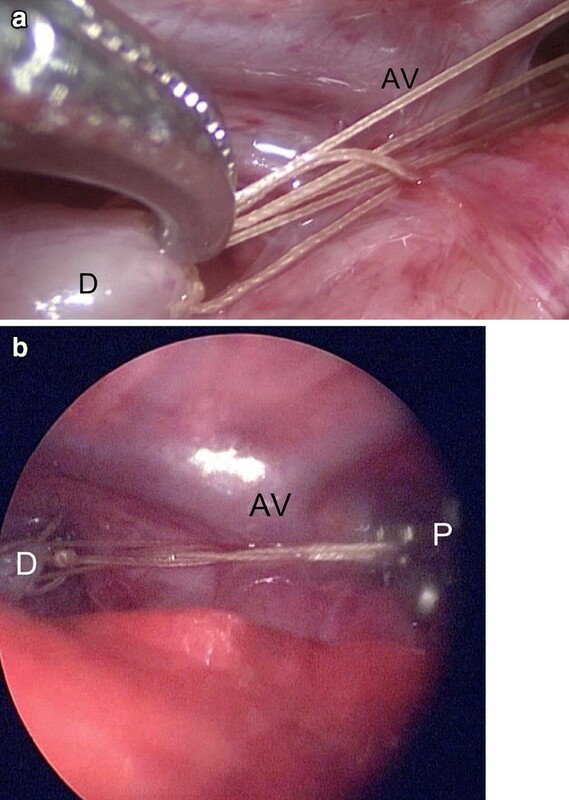 Long-gap esophageal atresia is defined by the impossibility to perform a primary anastomosis after birth. We propose a progressive traction surgery by thoracoscopy performed at intervals of 5–7 days. We describe the traction technique of the esophageal pouches through the thoracoscopic approach and without performing a gastrostomy. We use sliding sutures and clips to prevent esophageal tearing and preservation of the azygos vein. In a series of three patients, we have being able to reconstruct the esophagus in a period of 1–3 weeks after birth without complications. 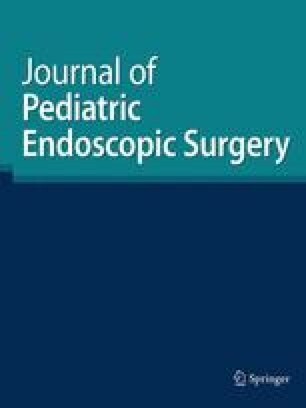 Repetitive thoracoscopy at shorts intervals in the neonatal period allows a tension-free anastomosis of the esophagus in long-gap type esophageal atresia. Long-gap esophageal atresia is still a difficult problem-solving situation with high morbidity and mortality. In this work, we show the technique of traction of the esophagus performed by thoracoscopy to achieve its elongation in an optimal time. Esophageal elongation procedures initially described by Kimura  and later by Foker , were implemented using thoracoscopy by Patkowski . The proposal in pursuing this procedure at early stages was to avoid the placement of a feeding gastrostomy in these patients. To create optimal surgical conditions, such procedures must be performed at regular intervals with a trained team and in the presence of suitable instruments and equipment to offer safe completion and have favorable outcomes. Before surgery, a flexible bronchoscopy is done to explore if a tracheoesophageal fistula (TEF) is present and to determine its anatomical position. An endotracheal tube is placed to perform two-lung ventilation. It is not advisable to perform a single-lung ventilation in these patients. The patient is placed in prone position with slight right-side elevation (10°) to expose the axilla. Small rolls under the shoulders and pelvis improve lung ventilation. We place the patient in the surgeon’s border of the operating table to avoid instruments’ motion limitation. All body pressure areas are protected and normothermia is controlled. The surgical team is on the right side of the patient and the scrub nurse on the left side and down the operating table. The ports are positioned in this way: camera (3 or 5 mm) at the anterior axillary line fourth intercostal space; a second port at the mid-axillary line, third intercostal space (3 or 5 mm) for clip applier, needle holder, Maryland dissector, hook and introduction of sutures; the third port at the posterior axillary line fifth intercostal space (3 or 5 mm) for instruments. Controlled CO2 pneumothorax is set at 4 mmHg (up to a maximum of 6 mmHg) of pressure and gas flow rate at 1 L/min (0.5 L/min in patients less than 3 kg). After introduction of the scope, the azygous vein is identified and preserved. The parietal pleura inferior to the azygous vein is then opened to identify the distal pouch or the TEF if present. Esophageal pouch is grasped and gently mobilized by blunt dissection without diathermy. The vagal nerve is easily identified and preserved. The ligature and section of the TEF must be done at this time by suture or clips. The proximal esophageal stump is now dissected by blunt dissection, avoiding further extensive proximal dissection at this stage. A 4/0 or 5/0 absorbable suture, 10–15 cm in length, is introduced through the 5 mm trocar. The needle is directed to the proximal pouch, taking a good stitch through the muscular layer. Then, the same is done at the tip of the distal pouch. Great care is taken to avoid a superficial suture. Intracorporal sliding (tumbled) knot is then performed, approximating both ends as much as possible (Fig. 1a). This type of suture is repeated one or two more times, bringing both pouches to a reasonable tension. Two metallic clips are then applied to both ends, taking the threads of the sutures and the esophageal wall into it to distribute traction forces uniformly along the esophageal wall and avoid subsequent esophageal tears (Fig. 1b). A drainage tube can be placed for 24 h, but it can also be avoided in absence of air leaks. All wounds are closed with vertical mattress cutaneous suture. A chest x-ray should be done immediately after surgery. At least another x-ray should be performed 24 h after the operation and another before the next stage. Five-to-7 days later the second thoracoscopic procedure is scheduled. The same described position of patient, trocars, and surgical team is applied. At this time all instruments and ports are 3 mm in diameter. If further clip is needed we change one of them by a 5 mm one. With two Maryland dissectors both esophageal ends are grasped and traction applied to evaluate its proximity and tension. If both pouches cross over, we readily proceed to perform the anastomosis (Fig. 2a). This is done using 6/0 absorbable sutures which are introduced by the 3 mm ports. The clips are removed and the first intracorporal sliding stich is done at the posterior side without opening the esophagus to bring both ends together. Then the former traction sutures are removed and both pouches opened. We do a posterior and anterior suture first. Then the left side of the esophagus is sutured leaving the knots inside. The right part is then sutured leaving the knots outside (Fig. 2b). If there is still tension bringing both esophageal pouches together, a sliding suture brings both ends closer and clips are again applied to the suture line. In this case we plan a third stage 5–7 days later to repeat the procedure. Esophageal contrast study is performed 1 week after anastomosis (Fig. 3). Over a period of 1 year we treated 3 newborn patients with long-gap esophageal atresia (two types A and one type C). All were operated with the technique described above, obtaining a tension-free anastomosis during the second or third intervention. The anastomosis was only performed when the esophageal pouches showed absence of tension at the suture level, that is, when the pouches intersect and cleanly surpass the point of contact. In our judgment, the critical points are to use a fine material, to avoid the absence of gas leakage to maintain a good visualization of the surgical field throughout the procedure, and finally apply the necessary traction so as not to tear the wall of the esophagus. To do this, applying a few metal clips that enclose the suture and the wall to create a uniform traction line in the lower part of the esophagus is essential. This maneuver prevents traction at a single point and therefore, the chances of the suture being released by tissue fatigue. Avoiding a gastrostomy will facilitate the ascent of the distal pouch . Parenteral nutrition allows nourishing the patient during the time necessary for initial healing of the esophageal suture. In the first surgery we tried to dissect quite a few both pouches. The intention is to preserve vascularization and innervation of the esophagus as much as possible. Extensive dissection of the proximal pouch is performed when we see that the pouches cross over. The preservation of the azygos vein improves the venous drainage of all anatomical structures of the chest, including the esophagus, and therefore, we must preserve it. 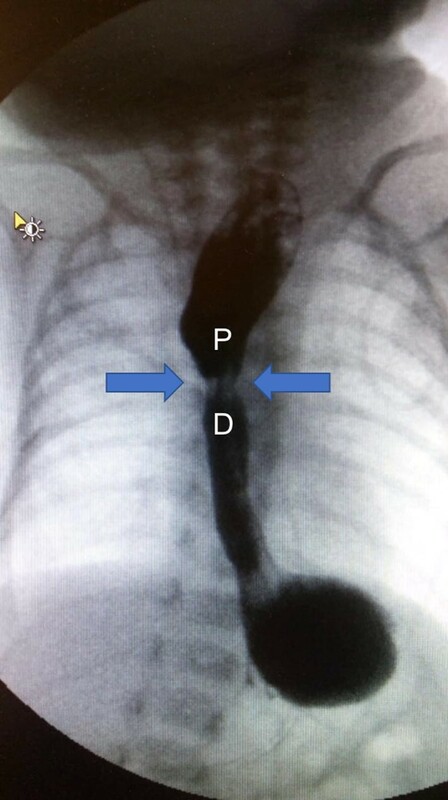 The esophageal pouches in the long gap are far from this vein, and therefore, it does not interfere to locate them. The low adhesion formation after thoracoscopy, together with a better visualization and preservation of all the anatomical structures in the thoracic cavity, allow us to do a surgery in programmed stages and obtain elongation of the esophagus in a very short time. Safe anastomosis is performed when both pouches intersect and cleanly surpass the point of contact. Short-interval staged thoracoscopic surgery can change the postoperative course of the worst form of esophageal atresia in newborns.